In August 2009, the newly renovated Middle School was awarded LEED Silver rating. The LEED Green Building Rating System is the national benchmark for the design, construction and operations of high-performance green buildings. 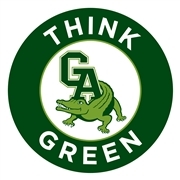 Click here to see real time solar generation at GA.
Greenwich Academy has partnered with Sodexo to provide green cleaning services in all our buildings. These practices provide a safer environment for everyone and reduce the environmental impact. GA’s recycling program begins with an emphasis on reducing waste followed by reusing resources. For example, students are encouraged to bring reusable water bottles rather than bottled water. GA’s buildings are equipped with building automation controls that allow for centralized control and scheduling of mechanical equipment. The systems are programmed to automatically reduce usage during evenings and weekends and other times when buildings are unoccupied. This results in significant savings, especially during holiday breaks. GA has partnered with EnerNoc to help relieve the New England electric grid when the grid is stressed and unstable, usually during extremely hot weather. When EnerNoc calls for relief, Greenwich Academy assists by reducing our overall electric usage and by transferring some of our electric usage to the backup power generator at the Upper School. This helps protect the environment by reducing the number of times that the power company to provide back-up power plants online. Greenwich Academy is privileged to have multiple conservation areas on its campus. This provides ample teaching opportunities. Many classrooms overlook wetlands, and students can observe wildlife and enjoy the moments of peaceful reflection that such an environment provides. These areas are protected according to wetland management regulations. The Greenwich Academy community is committed to preserve this area for the future. Continuing to reduce energy use, GA has implemented a green roof. A green roof is a naturally landscaped roof, providing a home for small animals and insects. The materials on the roof also help reduce the “urban heat island effect,” which helps keep the building cool, thereby decreasing the amount of air conditioning required. GA’s integrated pest management plan includes organic turf care and a pesticide-free campus. Sustainability and efficiency have been a large part of the construction and renovation of the school campus. Greenwich Academy is committed to buildings that meet the U.S. Green Building Council’s LEED Silver standard or equivalent. Using motion sensor lights around campus has decreased the Academy’s energy costs. Through efficient design, natural sunlight has been provided a natural resource for light throughout the school. State-of-the-art light fixtures that feature reflective lighting and daylight harvesting have been installed in the Upper and Middle Schools.